Regular cleanings and filter changes are essential maintenance for any ice or water machine. Whether you’re renting or buying, we’ll make sure your equipment is producing the cleanest, highest-quality H2O. Our team of ice and water specialists can help you find the perfect fit for your office needs based on employee usage. Stock your breakroom with on-demand hot and cold water for drinking or for making a crisp pot of fresh coffee. Parks Ice & Water offers installation, cleaning, sanitization, repairs and services, as well as routine maintenance and filter changes. Should your ice or water system need a check-up, give us a call at 800.870.8085, and a certified technician will address the problem within 24 hours, with fast, friendly and efficient service. 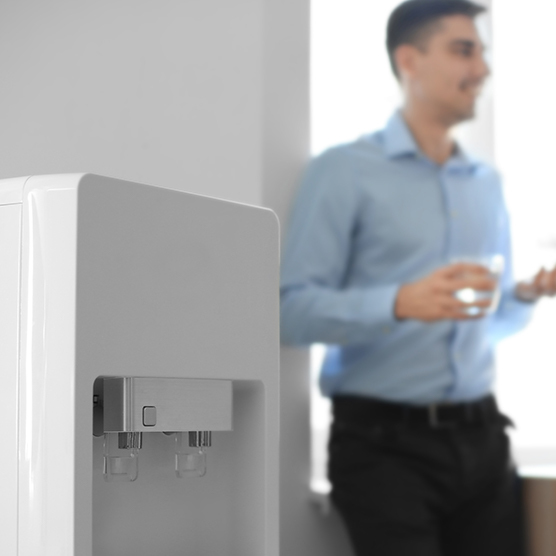 From high-volume dispensing water units to simple counter-top equipment, Parks Ice & Water provides filtered water/ice services to all of our current customers. Through regularly scheduled cleaning and filter changes, our service team ensures you and your employees will always have clean, clear and refreshing water. Proper cleaning of your water cooler and ice units is imperative in keeping your water source free of bacteria and tasting great.